the agency overseeing the “guided transportation systems” in France publishes some numbers worth to be repeated . Though that the sample sizes prevent to draw definitive conclusions: we can still exhibit some trends: not surprisingly multi year studies tend to show that subways  are order of magnitude safer than LRTs . This said, it is interesting to probe the source of tram accidents, what is provided by the graphs below. It can be interesting to compare the french statistic to the American one, as reported by the Bureau of Transportation Statistics. 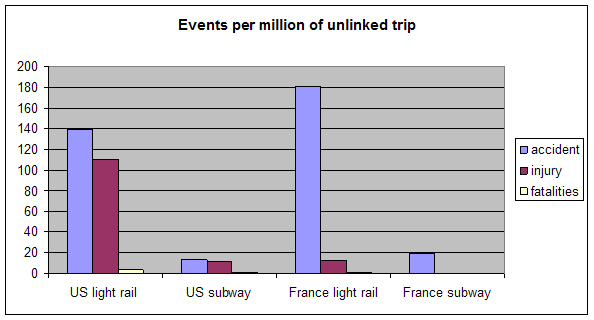 Though that the accident ratio between subway and LRT witnessed in France is also founded in USA, there is a striking difference in the number of casualties per million of trip. statistics are not including casualties due to suicide, but suicide characterization can be different according to the country. Thought that casualties due to suicide are not well documented, anecdotal evidences seem to show that the French authorities are more willing than the North American ones to classify an accident as a suicide: Some officious counting report around 70 suicides per year on the Parisian RATP metro alone , when this number is of around 30 in New York City , and 15 in Toronto . For purpose of a study on the suicides in the Montreal subway, the researchers have requalified fatalities, considered as accident by the coroner, as suicide . That said, the American LRTs still seem more prone to accident than their french counterpart. We can attempt some explanations to it. .
LRT accidents are significantly due to third parties, and eventually the measure of accident/trip is unfavorable to the less patronized US LRT vehicle. This explanation can be countered by the fact that busy LRT lines involve busy pedestrians traffic around their route, hence increasing also the chance of accident. 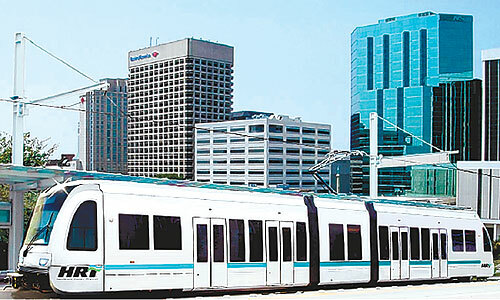 it has opened in 85, has 3 lines, totalizing 42km, and carrying an average of 266000 riders /day. Interestingly enough, according to the Nantes transit agency, their BRT records a rate of accident twice less than their trams, though their buses go faster . 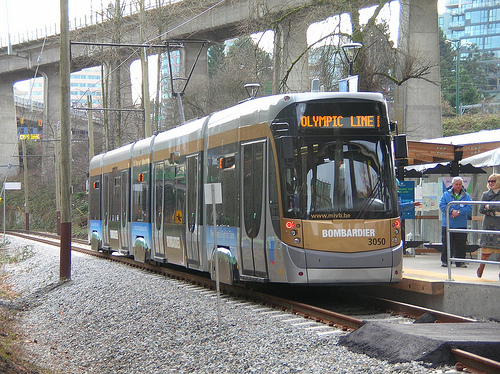 It is eventually due to a better designed right of way for the bus than for the trams . Transportation mode share of 14 metropolitan area with tram in France, from “Les deplacements a Nantes metropole Etude N 80, decembre 2009, Insee Pays de Loire, France citing “enquêtes nationales transports et communication 1993-1994, transports et déplacements 2007-2008”, Insee, SOeS and Inrets. This is a very important issue, and I thank you for posting about it.